A few years ago, Oregon’s first lady, Cylvia Hayes, shared her rags-to-riches journey — from her dilapidated childhood home in Washington state, to a tent on government land in Oregon, to the governor’s mansion, where she now lives with Gov. John Kitzhaber (D). Hayes, 47, wiped away tears during a news conference Thursday, explaining that when she married the 18-year-old immigrant in 1997, she was “associating with the wrong people” and attempting to pay for classes at Evergreen State College near Seattle. She said she used the money to buy a laptop and cover school expenses. She was so “ashamed and embarrassed” about the illegal union that she never even told Kitzhaber, her fiance — until the Willamette Week peeked into her past earlier this week. Hayes was twice divorced and not yet 30 when she married an Ethiopian teenager identified as Abraham B. Abraham, whom she met through a mutual acquaintance in Washington state. He was allegedly trying to stay in America to obtain a college education. Hayes said the two saw each other only a handful of times and never lived together. “It was wrong then and it is wrong now and I am here today to accept the consequences, some of which will be life-changing,” she said. Abraham eventually earned a mathematics degree from Greensboro College in North Carolina. He now lives in the Washington, D.C., area, according to public records. He declined to respond to calls and texts from the Willamette Week, and he refused to speak to a reporter who went to his home. Although marriage fraud is a federal felony, there’s a five-year statute of limitations, meaning Hayes could not be charged as of 2002. However, there are no limitations on civil penalties. The Oregonian reported that the government has the power to revoke the man’s legal status. Hayes said she has hired an attorney in case there are legal consequences. Shortly after Hayes got married, she loaded her two dogs in an old Toyota and moved to Oregon. She told the Oregonian in 2011 that she “literally set up a tent on [Bureau of Land Management] land” in the summer while writing her thesis. She said Thursday that once she got established in Oregon, her past “felt very, very distant and far removed” from her new life. “I became an active and engaged civic volunteer, community member and I became active politically,” she said. She started a clean economy consulting firm called 3EStrategies. She unsuccessfully ran for Oregon’s House of Representatives in 2004. That’s when she met Kitzhaber. Years later, Hayes became one of the first live-in partners of an Oregon governor. Kitzhaber calls her the state’s first lady. Kitzhaber and Hayes confirmed their engagement in August. The governor’s office did not respond to an e-mail seeking comment late Thursday night. The story came to light Wednesday when the Willamette Week wrote a story about her private consulting work. In the article, the paper reported that she had been married and divorced three times — only two had been previously publicized. 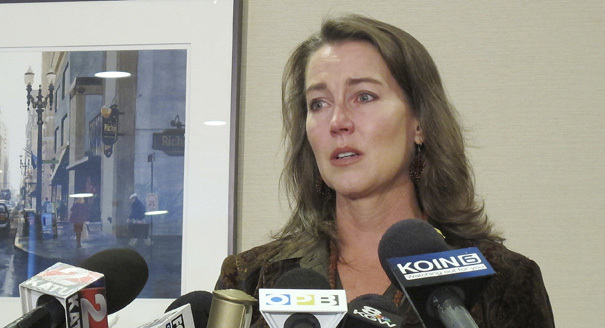 At Thursday’s news conference, Hayes spoke alone, saying she cannot even look at Kitzhaber without crying. She said she is most upset by how the governor found out about her illegal marriage. She apologized to Kitzhaber, her friends and family, and Oregonians. Seventeen years ago I made a serious mistake by committing an illegal act when I married a person so that he could retain residency in the United States. It was a marriage of convenience. He needed help and I needed financial support. We were both living in Washington. I was attending Evergreen State College, and we were introduced by mutual acquaintances. This was a difficult and unstable period in my life. I want to be clear today — I was associating with the wrong people. I was struggling to put myself through college and was offered money in exchange for marrying a young person who had a chance to get a college degree himself if he were able to remain in the United States. We met only a handful of times. We never lived together. I have not had any contact with him since the divorce finalized in 2002. It was wrong then and it is wrong now and I am here today to accept the consequences, some of which will be life changing. And I cannot predict what direction this will go. In the few years after this bad decision I completed my degree, got my feet underneath me and established my home and career in Oregon. I became an active and engaged civic volunteer, community member and I became active politically. My decision to marry illegally felt very, very distant and far removed from the life I was building. I was ashamed and embarrassed. Therefore I did not share this information even with John once we met and started dating. This is the most painful part for me. John Kitzhaber deserved to know the history of the person he was forming a relationship with. The fact that I did not disclose this to him meant that he has learned about this in the most public and unpleasant way. This is my greatest sorrow in this difficult situation. I apologize deeply for my actions and omissions, first and foremost to John, the person I love and respect above all others. I also apologize to my friends, family and colleagues who have trusted and supported me. And to Oregonians, I deeply regret not being right up front about the fact that I had made a serious mistake. I owe you all an apology. The work that I do on behalf of our environment and trying to make people’s lives better is incredibly important to me — it’s the focal point of my life. I will continue to do my best in that arena going forward. But for the time being, there are more important issues. I need to take some personal time to reflect and address this difficult situation and to focus on my relationship with John.